Four South Africa men convicted for their role in an Equatorial Guinea coup plot will not be re-arrested when they return home, officials say. "They have been punished for their action," said deputy international relations minister Ibrahim Ibrahim. The group, along with former British mercenary Simon Mann were pardoned by Equatorial Guinea's leader this week. Mercenary activities are banned in South Africa, but a person cannot serve a jail term twice for the same offence. 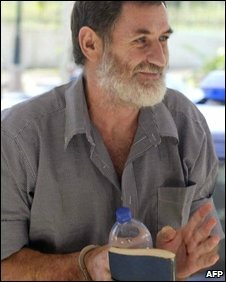 After the prisoners' release, one of the South Africans, Nick du Toit, said they had been told South Africa's president had been involved in the negotiations. Their release coincided with a visit to Equatorial Guinea by South African President Jacob Zuma. "The president [of Equatorial Guinea] said: 'I am one of those who have been taught by [Nelson] Mandela, that as Africans we must forgive,'" Mr Zuma said. It is not clear when or if the freed men are arriving in South Africa. Private security sources told the South African Press Association that they had landed on Thursday night. However, the department of international relations, which is reportedly organising their repatriation, said it had "not been advised of anything". Du Toit was arrested in Equatorial Guinea at the same time as Mann was arrested in Zimbabwe in March 2004, along with more than 60 other South Africans. They were suspected of being mercenaries intent on toppling Equatorial Guinea's President Teodoro Obiang Nguema. Mann served three years in a Zimbabwean jail before being extradited to Equatorial Guinea in 2008 where he was tried and sentenced to a 34-year jail term. He admitted conspiring to oust President Obiang, but said he had only been "a pawn" in the plot. Before leaving Equatorial Guinea, Mann, expressed regret for his part in the foiled coup. He also reiterated his claims that London-based Lebanese millionaire Ely Calil and Sir Mark Thatcher, son of former UK Prime Minister Margaret Thatcher, had been involved in the plot. He said he was anxious that they "face justice". Sir Mark, who now lives in southern Spain, was fined $500,000 and received a suspended sentence in South Africa in 2005 for unknowingly helping to finance the plot. Mr Calil has always strongly denied any involvement in the plot. Mann is to be questioned by British police, who are investigating whether any offences relating to the coup were committed in the UK.